Go on a rampage with Crankosaurus Prime! The complete adventure now awaits you. Set out on a puzzle-adventure to save the crystals you've sworn to protect. The Greedy Oil Tycoon, the Meddling Archaeologist and the Evil Mad Scientist must be stopped, the Blue Crystals hold a power that man is not meant to control! 11 exciting levels to Smash your way through, Outwit your adversaries and Push stuff! 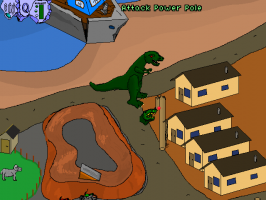 Stomp around like a Dinosaur without leaving your chair! Really enjoyable and unique game. The controls and puzzles were interesting and really added to it feeling like you were actually controlling a dinosaur and not just any adventure game character. The visuals aren't great but they get the job done and there is a lot of attention to detail - nice job Mite!! Check out the NEW V1.8! Lots of extra goodies and gameplay improvements for your destructive little selves to enjoy! That was an INCREDIBLE amount of fun!!! At times it really felt like I was playing the old Rampage arcade game: CRUSH-KILL-DESTROY!!! And also the puzzles were very clever for those moments of clarity when I wasn't just smashing everything in sight, and I must say WELL DONE right here on fitting so many complicated puzzles into a game where you play a 30ft tall dinosaur bent on revenge. Wonderful game which really shows off the effort you have put into it!